Editor’s note: This article is part of a series of reflections on the 2017 Canadian History and Environment Summer School. You can find all the articles here. How surprising and fortuitous, CHESS 2017 walked me and my fellow participants directly through the eerie landscape of Ontario’s Indigenous dispossessed. From the first words uttered by Bonnie Devine in her stirring keynote address on the political maneuvering that resulted in the Toronto Purchase and the subsequent addendums to render that purchase both legal and tangible, I knew I would be haunted by the spectre of settler colonialism throughout the workshop. As a PhD student from Michigan State University, and a disciple of Dr. Susan Sleeper-Smith, I am dedicating my life to studying the history of Great Lakes Indians, particularly the many different groups of Anishinaabe people. When word of CHESS 2017 reached me, I had recently decided to expand my area of research from the Lower Great Lakes to include and possibly problematize the U.S.-Canadian border by studying Anishinaabeg migration over the entire Great Lakes region throughout the nineteenth century. But still, at this point, I had only just turned my gaze north of the border, and again, Toronto was not yet on my radar. By the time I received word of my acceptance to this year’s program, I had recently delivered a presentation on the inadequate attention paid by scholars to the Michigan-Ontario border. I thus felt both emboldened and reaffirmed by this admission. I knew next to nothing about Canadian history, but I knew it needed to be compared to the United States, especially in reference to Indigenous peoples and fluid conceptualizations of borderlands. My own research at this point specifically revolved around Chicago in the era of Indian removal and its aftermath. Because much of this history centers on the tensions between American settlers, the Indigenous peoples who occupied the lands those settlers craved, and the British in Canada who encouraged and enabled Indigenous resistance to this settler encroachment, I found myself continually widening my focus to include Canadian history and historiography. When my research finally expanded enough to include Toronto, I knew exactly what my dissertation needed to be. Chicago and Toronto, super metropolises by the twentieth century, followed somewhat similar trajectories throughout the nineteenth century, especially in the context of settler colonialism. I am working on a project that compares these two cities in a larger Great Lakes context, where Anishinaabeg cultural continuity over time and across space will be the central theme. So it is, when I describe CHESS 2017 as fortuitous, it is because the very first slides in Bonnie Devine’s presentation were of British maps that charted the suspicious purchase from the Mississauga people at the end of the eighteenth century. 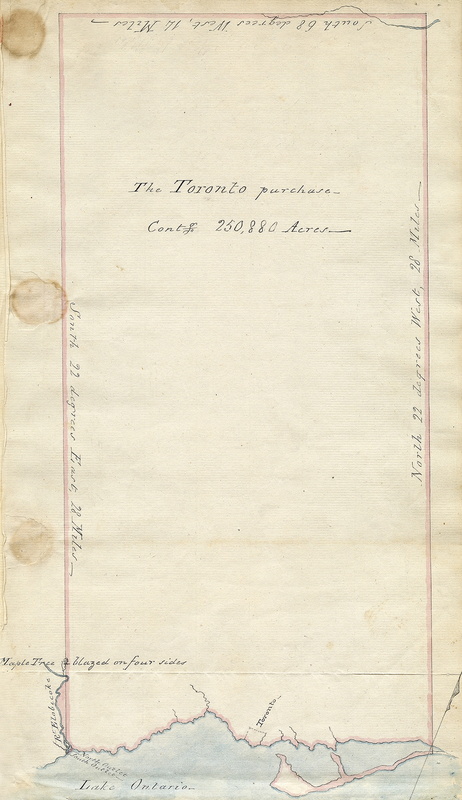 Map of Toronto Purchase referencing the Maple Tree used as surveying marker. CHESS 2017 was fortuitous for me when I was introduced to elders of the Mississaugas of the New Credit First Nation. I then heard the history of this dubious land surrender from a very human perspective, one that contradicts much of what appears in the colonial record. I toured the grounds of the Mississaugas of the New Credit First Nation Reserve, as well as the museum located on the adjacent Six Nations Reserve. I learned that the Mississaugas, after being dispossessed of their large landholdings in Southern Ontario, were then offered by their old rivals, the Six Nations a tract of land to settle. I felt further haunted during a tour of the Mohawk Institute on the Six Nations Reserve. As an American scholar, I know very little about the horrors of the Canadian residential schools. However, as one interested in the connections between history and memory, the tour of such a torturous location left a deep and personal imprint on my conception of Canada’s treatment of its First Nations peoples. CHESS 2017 was fortuitous for me, but not only for the reasons listed above. As Sean Kheraj pointed out during one of our many bus rides between historic locations, CHESS is about the bonds one forges with other fascinating scholars. These bus rides served as a forum for stimulating conversations on anything from professional research to travel aspirations to the intricacies of managing a family with the rigors of life in academia. CHESS provided me an alternative scholarly environment to the classroom or the conference hall, a place where deep and hopefully enduring connections transpired. As an American historian focused on Indigenous cultural continuity across the U.S-Canadian border, CHESS served as a welcoming introduction to the world of the Canadian scholar. I am extremely grateful for my inclusion in the program, and I look forward to fostering these new connections. Great to hear you are comparing Toronto with Chicago!